Ferrari 70 Years celebrates Ferrari's fantastic history with detailed text and fascinating images from historic archives. For 70 years, Ferrari has produced automotive works of art to fire the imaginations of car lovers worldwide. A stellar combination of beauty, performance, racing success, exclusivity and Italian flair have combined to make Ferrari the world's most iconic carmaker. All these traits coalesce in the form of Ferrari's road cars. From the 125S in 1947, to the versatile 340 in the 1950s, to the stunning 250s and 275s of the 1960s, to the Daytona, to the shocking F40, to the modern era's outrageous hypercars the Enzo and LaFerrari, no other sports car manufacturer has so consistently set the bar for style and performance. It's a near unbroken 70-year run of hits. Ferrari 70 Years lifts the hood on Ferrari's sports car history beginning in 1947, but also touches on Enzo Ferrari's early career with Alfa-Romeo before he launched his iconic company. 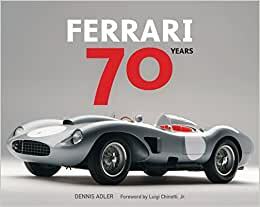 Author Dennis Adler offers Ferrari owners and fans an engaging and comprehensive history of Maranello's extensive sports car range. Adler's detailed text is accompanied by his gorgeous photography and supplemented by fascinating images from Ferrari's historic archive. There is simply no better way to celebrate Ferrari's fantastic history. Award-winning author, photographer, and historian Dennis Adler is one of America's most published automotive authors and historians. He has appeared on Good Morning America, The Today Show, and CBS Sunday Morning. The author of dozens of books on collectible automobiles and historic firearms, as well as a former magazine editor, Adler has had more than 5000 articles and photographs published during his long career. 3.0 out of 5 starsA minor update to Adler's previous book Ferrari The Road to Maranello. This book is basically the same Adler's previous book "Ferrari The Road to Maranello." It has a minimal update on a few of the newer cars, but in my opinion the extra pages didn't warrant the cost. The forward, text and pictures are the same in most cases. However, if you don't have the first book by Adler, mentioned above, I do recommend this as a good Ferrari read as it contains a lot of useful information. However, you don't need both. Great Ferrari book marred with poor editing... several mispellings... repetitive and redudant sentences in some and images don't match the ongoing page. With better editing this book will be so much better. 5.0 out of 5 starsGreat book for any Ferrari aficionado. Amazing coffee table book, a must have for any Ferrari aficionado - great quality print, detailed pictures, great articles describing Enzo's ideas, his struggles to establish Ferrari as a leading super-car, and future prospects of the company. 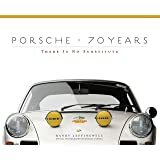 Makes for a great gift - goes really well along with the Porsche book. Not cheap, but worth the money. Beautiful book! My husband loved it for this birthday!